Will Russia ever revert back to a monarchy? Among those who are not against the return of the monarchy is a large number of young people between the ages of 18 and 24. 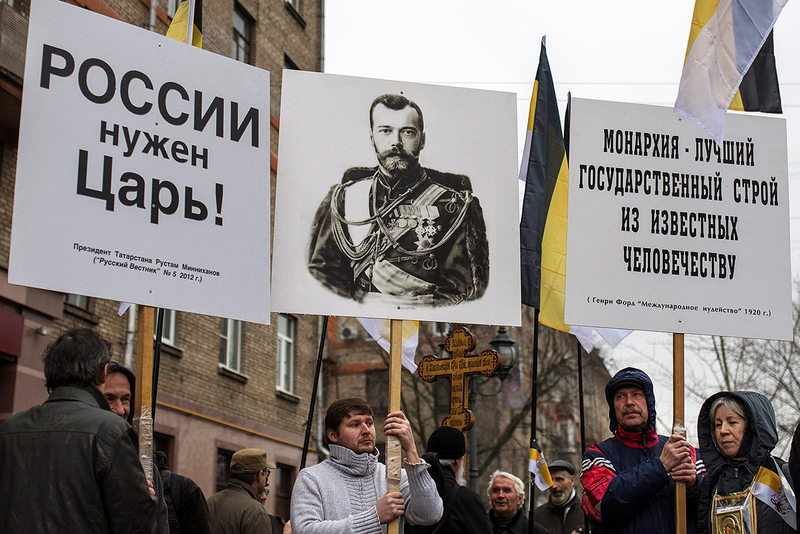 Most Russians who want to see a tsar in power are young city dwellers. Modern monarchists claim the older "brainwashed" generations don’t understand because their communist schooling was negative. About one fourth of Russians (28 percent) are not against the return of the monarchy, according to a survey conducted by the All-Russian Center for Studying Public Opinion (VCIOM). This news is fairly old hat though, considering that for the last five years one fourth of Russian citizens polled have sought the return of the czar, with descendants from the House of Romanov occasionally being invited to Russia. However, no government officials are giving the idea of resurrecting the monarchy oxygen – in public anyway. The State Duma speakers believes that any change of order would be "unpromising" and President Vladimir Putin is also not optimistic about the idea. But rather surprisingly, among those who are not against the return of the monarchy is a large number of young people between the ages of 18 and 24. This demographic also made up the majority of people who recently rallied on the streets across about 100 Russian cities. Moscow and St. Petersburg residents, active Internet users, and supporters of parliamentary parties make up the majority of the monarchists, according to socialists. But the mass media does not report on the monarchists, who argue on the Internet who should become czar. "My father is a liberal democrat, my mother and brother are apolitical. Since my childhood I've been interested in history, also outside of school. Gradually I became a monarchist," says 18-year-old Alik Danielyan. In VKontakte, Russia's most popular social network, he heads the Monarchy Enclave group, which has almost 14,000 subscribers. In his words, the reason why the young generation is not against a monarchy is "very simple": The old people with their "brainwashed" Communist mindsets and views are gradually disappearing, and they are being replaced by young people. And these young people often see the inadequacy of the modern republic. "The republic does not beget those who are capable of governing the country. It begets people who are capable of winning the election, cunningly stealing their piece of the pie," Alik explains. He is convinced that it would be different with a monarchy. This is an excellent method to reproduce the governing elite, which would be ready to govern from a young age. And most importantly, they would not need to get involved in intrigues and sully their hands in dirty affairs to obtain power. The young monarchists preach this idea in other social network communities. The common thought is that this is necessary "so that no one would hog the cover," notes director of VCIOM's research department Stepan Lvov. In other words, there is more stability this way. It is debatable if there should be an absolute monarchy with an autocratic ruler, or a parliamentary monarchy as in Spain or the UK. In any case, young people believe that this political order does not exclude freedom and democracy; it is also more effective. It must be noted though, given Putin’s grip on the country – and a number of other reasons – the likelihood a monarchy would return to Russian remains very slim indeed. "There are no more people in our country who lived during the monarchy. This is why personal experience definitely does not influence people's views. The young people don't have that "antimonarchist vein" of the previous generation, which in school was taught that a monarchy is something archaic, obscurant, and bad. Today's education system does not have the objective to form a negative attitude towards the monarchy. This is where the monarchist tendencies come from," Lvov remarks. Today in Russia there is only one registered pro-monarchist party - The Monarchist Party of Russia. It has 47 regional branches. But if the monarchists ever appear in the news, it is in the format of "village idiots." They are famous for having burned books by J. K. Rowling and Vladimir Sorokin, broken up a gay parade in Moscow, buried a toy monkey as an anti-Darwin protest, created the slogan "Orthodoxy or death!" (which a court recognized as extremist) and intended to buy three uninhabited islands from the Pacific Ocean nation of Kiribati to resurrect the Russian monarchy on them (the government declined the Russian millionaire's offer). Based on all this it is not surprising that most Russians see the monarchists as "dressed up," said political analyst and director of the independent Political Expert Group Konstantin Kalachev. "Monarchist organizations in Russia play the role of an exotic appendage to political fuss," he adds. Various aristocratic societies that were popular in the 1990s came to naught after many organizations appeared contemporaneously, discrediting the idea of aristocracy itself. The organizations were giving out prince and baron certificates left, right, and center, remembers Kalachev. For now the real monarchists prefer to "save their strength and wait," notes Alik. They see a possibility of becoming a concrete power no sooner than in 10 years and all their activity today takes place at tea parties, evangelist circles, or assemblies of the Union of Descendants of the Izmailovsky Regiment. The latter turned out to be just a pretty name, since there are basically no descendants there. But the monarchists like it. Fifteen to 30 people attend such clubs. When asked what they do there, Alik responds: "Various things. From sessions to conversations with priests to presentations." They also discuss "European rightists" such as Donald Trump or Marine Le Pen, but "without fanaticism." "The rise of rightist forces in the world is to our advantage. Why shouldn't we be happy about it," Alik sums up.